Main objective of this report is to analysis the Use of Iodized Salt by the Rural Community. Report focus on to find out the extent of rural community using Iodized salt and there knowledge on it’s deficiency disorder. Other objectives are find out the knowledge of rural people about Iodine deficiency disorder and find out the extent of Iodine deficiency disorder in the community. Finally assess the socioeconomic characteristics of the rural Community and determine the presence of Iodine in salts used by the rural community. This study was a cross-sectional type of descriptive study and was carried out in selected villages to find out the use of iodized salt by rural people, assessing the knowledge regarding iodine deficiency disorder (IDD) and prevalence of goiter. Data was collected from all households considering one person as a respondent from each household. The sample size was 200 households with 986 populations. Data was collected by face-to-face interview through pre-tested questionnaire and checklist. Collected salt sample was tested with iodized salt testing solution. Female respondents were more than male; mean monthly family income was 4635.51/= per month. Mean age of the respondents was 36.1 years, Literacy rate consistent with national adult literacy rate but level of education higher secondary and above was minimum (5.5%). Day laborer, cultivation and housewife were the main occupation. All most all of the female respondents were housewife. About 25% of the respondents know that iodized salt can prevent goiter and 24.5% have some knowledge about IDD. 12.5% of the respondents were open salt users but only 62.5% household salts had iodine. The most common cause of using open salt was high price of packet salt in comparison to open salt. The prevalence of goiter found was 4.86%, among them 70.83% were female and 29.16% were male. Of them 2.83% were grade –1 goiter and 2.02% were grade-2 goiter. The prevalence of goiter had decreased than before but it still remains high, correct knowledge regarding goiter was minimum and most of them knows nothing about IDD rather than goiter. Though the universal use of iodized salt law persists, the use of iodized salt is still not satisfactory. Non- iodized salt is available in the market and large amount of people are using it because of low cost and lack of knowledge about the benefits of iodized salt. These findings suggest that measures should be taken for improvement of knowledge about IDD and benefits of iodized salt. The author suggests Price reduction of iodized salt and proper implementation of IDD prevention act 1989 should be ensured for elimination of iodine deficiency disorders. Iodine is an essential micronutrient, requires for normal growth, development and well being of all human. About 90% of Required Iodine comes from the food and the remaining from the drinking water. The daily requirement of Iodine is 150 µg/day. Deficiency of iodine in diet leads to the wide range of effects on growth and development known as Iodine Deficiency Disorder (IDD) and that includes: Goiter of all ages, Endemic cretinism characterized by mental deficiency, deaf-mutism, spastic diplegia, neurological defect related to fetal iodine deficiency, impaired mental function in children, adult with goiter associated with reduced level of circulating Thyroxin and increased stillbirth, prenatal and infant mortality. Iodine deficient mother have frequent spontaneous abortion and children if survive have delayed physical and mental development. It is the most common cause of preventable brain damage. Iodine is an essential element in the chemical structure of thyroid hormones and iodine deficiency leads to a reduction in the secretion of these hormones. Iodine is vital for good thyroid function, which in turn is essential for health. IDD is now a global public health problem. WHO estimates that 2.2 billion people are at risk in 130 countries and 176 million have goiters in South-East Asia region. These people live in environments where the soil has been leached of iodine because of flooding in river valleys and high rainfall and glaciations in hilly areas. The deficiency in the soil leads to deficiency in all forms of plant life, including cereals and drinking water. Large human populations living in systems of subsistence agriculture in developing countries are consequently affected, for instance in the great river valleys of Asia. Though Bangladesh is a plane delta region with few hilly areas in North- East and South- East, endemic is prevalent throughout. The most affected areas are in the northern and central districts. In Bangladesh two major surveys, Nutritional survey of East Pakistan in 1962-64 highlighted the prevalence of Goiter as 28.9% while in 1981-82 national Goiter prevalence study mentioned the prevalence as 10.5%. In both, the prevalence rates of goiter were assessed as indicator of IDD. Iodine deficiency diseases are mainly common in hilly areas and reverie flooded areas. Perpetuate annual flooding, heavy rainfall, continuous deforestation and unknown role of fertilizers and pesticides and repeated cropping further aggravate IDD problem in Bangladesh. The IDD survey in 1993 in the country showed total goiter prevalence 47.1%, visible goiter rate 8.8%, and prevalence of cretinism 0.5%, nearly 69% of population being biochemically deficient in iodine. In 1981 to 1982 study it was found that the whole country was endemic and varies from district to district. It was found that the prevalence rate with 21% to 30 % exist in the district of Rangpur and jamalpur, between 11% to 20% in the district of Dinajpur, Bogra, Tangail, Dhaka, Mymensingh, Chittagong and Chittagong Hilltract, in addition more and more isolation pocket of endemicity, more than 50% exist in different locations. There is no doubt that the most prevalence of Goiter pocket is located in the Northern part of the country. IDD has been considered a big problem, which needs national strategy to control it. But no realization about this public health problem of IDD was noticed among the general people, even the policy makers before seventies and early eighties and as such no intervention programs either in the form of Iodized salt or Iodized oil were introduced in Bangladesh before 1986. As a result Government of Bangladesh in 1989 enacted a law for universal salt Iodination. After that period salt Iodination programme was introduced in this country with assistance from UNICEF, aiming at the reduction of the prevalence of IDD. Accordingly since then salt Iodination programme has also been introduced and extended in Bangladesh to produce Iodized salt in all the salt industries. The aim of Iodination was to supply Iodized salt to the entire population. Iodized salts have been supplied in packet form. But presently the experts and the news medias that Iodine free loose salts are also available in the market and are consumed by the people of the country have observed it. Open/loose salts are available in the markets, especially in the rural areas and at a cheaper rate. It is also reported that some non-iodized salts are also smuggled through the borders, which are cheap in cost and popular to the people residing in the border areas. The people of low socioeconomic groups prefer to by loose salts, ignoring the quality and absence of Iodine in it as it is within their reach. Because packet salts cost 15-18 Tk/Kg whereas open salt costs 8-10 Tk/Kg only. Packed Iodized salt, after manufacture is supposed to contain standard amount of Iodine in standard amount but due to prolonged preservation in open container. Iodine is a highly volatile substance and due to hygroscopic action salts absorbs water from the atmosphere and dissolves. As a result Iodine content is either gets off the container or sediment with water at the bottom of the container, which is often, gets off the container. Some recent studies showed that the percentage of consuming non-iodized salt in the rural part of the country is still high. For this reason the present study was designed to find out salt quality and the Iodine content of the salt in the household of the rural part of the country and also to find out how big the problem of Iodine free open salt is and also to recommend how to solve the problem. Iodine deficiency disorders are recognized as a global public health problem. In 1999 using the best available data from many sources including member states and other international and bilateral organizations, the World Health Organization estimated that 20% of humanity live in areas at risk of iodine deficiency. The, at risk and affected persons live in 130 countries and 176 million have goiters in South-East Asia region. In Bangladesh two major surveys, Nutritional survey of East Pakistan in 1962-64 highlighted the prevalence of Goiter as 28.9% while in 1981-82 national Goiter prevalence study mentioned the prevalence as 10.5%. The IDD survey in 1993 in the country showed total goiter prevalence 47.1%, visible goiter rate 8.8%, and prevalence of cretinism 0.5%, nearly 69% of population being biochemically deficient in iodine. These results shows that IDD has increased in Bangladesh over the past decades and is now sever. The wide spread of iodine deficiency in all ecological zone indicated that the country is as a whole is an iodine deficiency region. Repeated annual flooding, heavy rainfall, continued tread of deforestation, the unknown roll of fertilizers and pesticides and repeated cropping all of which aggravate the IDD problem. So, a complete reassessment of the present status of IDD is needed. In iodine deficient region iodized salt has been universally recognized as the strategy to eliminate the iodine deficiency in the population. To control IDD, though Bangladesh Government has passed a law in 1989, making it mandatory that all salt produced or imported must be iodized. With the help of UNICEF has launched a universal salt iodination program, with the goal of providing iodized salt to every household by the end of 1994. Study on 2002 showed that 60% of rural people are using iodized salt, which is much lower than the national target of universal use of iodized salt. Though Bangladesh government has taken several steps with view to control IDD by the year 2000, IDD control measure has yet to be successful. It is not clear weather the lack of knowledge about iodized salt or the salt they are using contain no iodine is responsible for the persistence of iodine deficiency disorder. Yet we don’t find any community based literature showing, what proportion of people is using iodized salt? So, prevalence of goiter and use of iodized salt, as well as knowledge about IDD and iodized salt is necessary. This study will help to evaluate the current situation of use of iodized salt by the rural community and create awareness among them about IDD and benefit of iodized salt. The study is also a modest attempt to identify the presence of iodine from the salts, the households are using regularly. What extent of rural people use iodized salt? What is the prevalence of goiter among them? What is the extent of knowledge about Iodine Deficiency Disorder among them? General objective: To find out the extent of rural community using Iodized salt and there knowledge on it’s deficiency disorder. To find out the knowledge of rural people about Iodine deficiency disorder. To assess the knowledge of rural community about the benefits of consuming Iodized salt. To find out the extent of Iodine deficiency disorder in the community. To assess the socioeconomic characteristics of the rural Community. To determine the presence of Iodine in salts used by the rural community. Time of using iodized salt during cooking. Types of salt refers to weather it is packet salt or it is open salt and Iodized salt or Non-iodized salt. The salts those are sold from a large container and no specific packet is used for specific amount of salt. The salts those are sold in packets and in specific amount of salts are in specific packets. Presence of iodine in salt samples collected from the houses of the respondents detected by salt tasting solution, supplied by Bangladesh council of Scientific and Industrial Research (BCSIR). Absence of iodine in salt samples collected from the houses of the respondents detected by salt tasting solution, supplied by Bangladesh council of Scientific and Industrial Research (BCSIR). Goiter means enlargement of thyroid gland. Grading of goiter will be done according to following grading system as recommended by the WHO (1992). 0 Thyroid neither palpable nor visible. 2 Thyroid palpable and visible with neck in normal position. Knowledge of IDD refers to the ability of knowing regarding cause and methods of prevention. Iodine is an essential micronutrient, requires for the synthesis of thyroid hormones. Daily requirement is 150 µg/day. Good knowledge about IDD refers to know that, goiter, mental retardation, critinism, retardate physical growth, etc. causes due to iodine deficiency. Moderate knowledge about IDD refers to, know that goiter and mental retardation causes due to iodine deficiency. Knows only about goiter refers to, know only about goiter as iodine deficiency disorder. Knowledge about the benefits of Iodized salt refers to the name of diseases prevented by iodized salt and Knowledge about time of using iodized salt during cooking. Correct knowledge about benefits of Iodized salt refers to the names of diseases prevented by iodized salt i.e. Goiter, Mental retardation, Critinism, Premature delivery, etc. The term prevents goiter refers that the respondents only know that iodized salt can prevent goiter. Knowledge about time of using Iodized salt during cooking refers to when they are using iodized salt during cooking. As iodine is highly volatile, the salt looses its iodine if it is heated for long time or if it is used at early part of cooking. The historical record of goiter dates back to about 2700 BC with a reference by the Chinese Emperor Shen-Nung about the use of seaweed to treat goiter. As early as 200-300 AD goiter appears in artwork present in sculptures of Buddha and his disciples. TheAssociation of goiter and cretinism is alluded to in drawings from the 13th century and is first noted by Paracelsus in the early 16th century. Surgery for goiter was performed at the early medical schools in Salerno (1170), Montpellier (1240), and Padua (1252). Renaissance art also contains many examples of goiter and is found in paintings by well-known artists including Rubens, Weyden, and DÃ¼rer.However; it is not until the 17th century that the thyroid gland is first described. In the 18th century the word cretin appears in print for the first time and is defined as “an imbecile who is deaf and dumb with a goiter hanging down to the waist”. The 19th century was important in the history of iodine deficiency. In the 1820s, iodine was identified in seaweed and in salt from a mine in Antioquia. It was in 1846 that Maffoni first hypothesized that goiter was due to iodine deficiency. The 19th century yielded one of the first national goiter surveys, commissioned by King Carlo Alberto of Sardinia (Sardinia included the provinces of Savoy, Nice, Piedmont, Genoa, and the Island of Sardinia) in 1848. The survey revealed 370,403 persons with goiter and 120,000 cretins or idiots in France with an estimated total population of 36 million. It is not until the late 19th century that iodine was identified in the thyroid gland. In the 19th century David Marine stated that ‘endemic goiter is the easiest known disease to prevent’. The first large scale trials with iodine were performed by Marine and Kimball (1922) in Ohio. In 1924, the first mass prophylaxis of goiter with iodized salt was carried out in Michigan. The prevalence of goiter and cretinism was high in the mountainous regions of Europe and seemed to decrease precipitously after the introduction of iodized salt. Also contributing to the decline in the prevalence of goiter was the importation of foods from outside the area of iodine deficient soil. Iodine deficiency disorders have been eliminated for more than 40 years in several countries including the USA, England, Switzerland, New Zealand and Australia. Iodine deficiency disorders were severely endemic in Bhutan 5 years ago, and, through salt iodination and iodized oil injections, now has been virtually eliminated. Similarly, Ecuador and Bolivia are close to elimination of iodine deficiency disorders. On the other hand, Europe, which was once considered non-endemic, has once again been reported to have a dangerous iodine deficiency disorders problem. In 1991 using the best available data from many sources including member states and other international and bilateral organizations, the World Health Organization estimated that 20% of humanity lives in areas at risk of iodine deficiency. The, at risk and affected persons live in 95 countries. The prevalence and morbidity of iodine deficiency disorders throughout the world requires further elucidation. It is only recently that scientists are beginning to appreciate that the effects of iodine deficiency may be insidious, causing mild to moderate intellectual impairment without the overt clinical signs of iodine deficiency disorders. Although iodine deficiency disorders are 100% preventable, most of its effects are irreversible after the second year of life. The full scope of iodine deficiency disorders morbidity is entirely preventable with the administration of the appropriate dose of iodine. The exposure or risk factor for iodine deficiency disorders is soil that lacks sufficient iodine and as such represents a regional exposure. Iodine deficiency disorders has been noted to affect not only whole families but also large proportions of villagers because the regions in which it occurs are often remote and depend exclusively on locally produced food. While the regional nature of the exposure may result in a high percentage of family members or village inhabitants being affected, it also means that intervention can be targeted regionally and efforts focused. The development of strategic plans for the elimination of iodine deficiency disorders is critical to the success of the process. Since the mid 1980s, The International Council for the Control of Iodine Deficiency Disorders (ICCIDD) has been instrumental in focusing the world’s attention on iodine deficiency disorders. The board met for the first time in Katmandu, Nepal, and since then has met annually or bi-annually and has been active in advocating the global elimination of iodine deficiency disorders through international, regional and national forums and training events, technical forums, publications and consultations. Iodine deficiency is the most common cause of preventable brain damage. WHO estimates that 2.2 billion people are at risk in 130 countries. These people live in environments where the soil has been leached of iodine because of flooding in river valleys and high rainfall and glaciations in hilly areas. The deficiency in the soil leads to deficiency in all forms of plant life, including cereals. Large human populations living in systems of subsistence agriculture in developing countries are consequently affected, for instance in the great river valleys of Asia. Iodine is an essential element in the chemical structure of thyroid hormones and iodine deficiency leads to a reduction in the secretion of these hormones. This is particularly important in pregnant women, who may not be able to produce the extra thyroid hormone required for normal fetal brain development in the first half of pregnancy. Alam stated that goiter the swollen neck gland that causes disorder in the economy of human organism is so common in Bangladesh that a survey in 1982 revealed that one in ten is suffering from this blot and other five are vulnerable and the other four have a tendency to develop it in some part of later life. This is due to lack of Iodine in the daily food. The requirement of which, in a span of 60 years of life is only 60 grams that is only a teaspoonful. Experts have shown that only thirty-taka worth of iodine is required for a lifetime to avoid swollen neck gland and associated troubles. National survey of rural Bangladesh in 1975-76 stated that in 1962-64 a high prevalence of goiter was observed in pregnant or lactating or both group of women. In 1962-64 four of every ten in this group showed goiter. In the current survey (75-76) three out of ten pregnant or lactating women showed this deficiency. Goiter was more prevalent among the females than among males. It was known that certain geographical areas namely Jamalpur, Rangpur and Dinajpur goiter of various grades occur in as much as 80% of the population. These areas were either hilly or frequently flooded and were thought that the iodides there were completely leached out of the soils. Water from ponds in these areas was analyzed for iodine at the laboratory of the Wisconsin, Alumri Research Foundation and extremely low values were found. A program for iodination of salt to eradicate goiter is urgently needed. Ahmed stated in touch the special feature of Iodine deficiency disease that they can easily be prevented and the remark of Executive Director of UNICEF for eradication of iodine deficiency in many developing countries was as follows: “ Iodine deficiency is easy to prevent that is a crime to let a single child be born mentally handicapped for that reason”. The main aim of the preventive measures was to eradicate iodine deficiency disorders. To achieve this goal, sufficient iodine should be supplied to the people of all ages with special preferences to the children and mothers. This can be done either by optimizing the iodine intake through daily food or by giving oral/parental iodine. The people should be educated to make them understand the significance of iodine deficiency and how to get it eradicated. Mass information media and personal contact through primary health care programme can do this. Iodine Deficiency Disorders still a challenge for the next Millennium. Recent evidence indicates that a low intake of iodine puts 29% of world population at risk of IDD, about 710 million people in Asia and 287 million in Africa and Latin America and some 20-30 million in Europe. 13 million people in South East Asia were estimated to be suffering from different degrees of mental and physical impairment due to Iodine deficiency. The magnitude of the problem is far greater than had been diagnosed. Only a few years’ earlier, more and more new areas being identified with iodine deficiency in Africa, Latin America and Asia. Some of the consequences of IDD are not reversible, but virtually all can be completely prevented by easily available techniques of iodine supplementation. An article of Stephen Walsh in 2003 Vegan Society, said that, Iodine is vital for good thyroid function, which in turn is essential for health. Iodine deficiency during pregnancy and early infancy can result in cretinism (irreversible mental retardation and severe motor impairments). In adults low iodine intake (or very high intakes) can cause hypothyroidism. Hypothyroidism can manifest as low energy levels, dry or scaly or yellowish skin, tingling and numbness in extremities, weight gain, forgetfulness, personality changes, depression, anemia, and prolonged and heavy periods in women. Goiter, an enlarged thyroid gland visible between the Adam’s apple and the collarbone, is often present. Hypothyroidism can also cause carpal tunnel syndrome and Raynaud’s phenomenon. Hypothyroidism can lead to significant increases in cholesterol levels and homocysteine levels is implicated in about 10% of cases of high cholesterol levels. Correcting hypothyroidism can lead to a 30% drop in cholesterol and homocysteine levels. From the magazine in touch January 1993 it was found that iodine deficiency leads to poor IQ, goiter, mild to severe mental retardation, dwarf ness and many other mental maladies. The more people suffer from iodine deficiency problems the lower is the IQ. In Bangladesh lakhs of people are the victim of IDD while about, billion people in the world are at risk, many of them living out their lives with reduced mental and physical capabilities according to the state of world’s children report 1993. People get iodine from food obtained from plants and animals. The people in areas experience seasonal flooding and rains suffer from iodine deficiency, because the water washes out the iodine from soil. Iodized salt can help to boost national IQ. Syed N. Huda in his article, “Biochemical Hypothyroidism Secondary to Iodine Deficiency Is Associated with Poor School Achievement and Cognition in Bangladeshi Children” in the Journal of Nutrition in 1999 said, Iodine deficiency in pregnancy leads to poor cognitive function in the offspring; however, the effect of concurrent iodine deficiency on school-aged children is not clear. Several studies have shown that school children in iodine-deficient villages have poorer cognitive function than children in iodine-sufficient villages. An estimated 1.6 billion people in the world are currently at risk from iodine deficiency disorders. Intrauterine iodine deficiency is well established as the cause of cretinism and lesser degrees of cognitive and motor disability, but little is known about the concurrent effect of hypothyroidism on the intellectual performance of school-aged children. There is a suggestion that low serum thyroxin (T4), secondary to iodine deficiency, is linked to poor intellectual performance of the people residing in iodine-deficient areas. Hypothyroid patients show slowing of intellectual function and speech and have memory deficits. In addition, a study of hypothyroid adults found significant correlations between T4 levels and scores on cognitive tests; improvements in cognition occurred with treatment. (1) Prevalence of goiter: total goiter rate (TGR) (grade I+ grade II) in Bangladesh is 47.1%. Zone wise, the prevalence rate was 44.7% in the hilly, 50.7% in the flood prone and 45.6% in the plane zone. (2) A high goiter prevalence rate was also observed in study population of the plane zone. The total of 11,307 respondents were examined 4,093 (36.2%) were found to have grade-I and 1,061 (9.4%) had goiter of grade-II. The total goiter rate was 45.6%. There was a slightly higher prevalence of grade-I goiter in the children, 40.0% compared with 33.6% in adults, while grade-II goiter was almost equal in both group of population (8.7-9.9%) slightly higher prevalence of TGR in child than adult. A USI evaluation survey during 1996 showed that about 99% of the salt samples collected at factory level were iodized, but only 5 % were adequately iodized; many factories were producing salt with too low or too high iodine level. During 1998, the Micronutrient Initiative (MI) did an in-depth assessment of some large salt factories with particular emphasis on SIP. That assessment included testing of iodine content of salt collected at various points of production: from the auger-screw mixer at 5, 10, and 15 minutes into a 5 ton production run; from different levels of the post-iodination storage chamber; from 75 kg bags ready for shipping; and from the pre-iodination storage chambers. Iodine content was measured by the semi-quantitative paper strip test used by the industry to monitor production, and by titration. Critical observation of mechanical condition and performance of SIP also was made. The key findings were: (i) Inconsistent iodine level in salt collected at various points of production of same factory, (ii) Gross inter-factory variations; (iii) Lack of agreement between the semi-quantitative test for iodine content and titration; (iv) Mechanical problems at SIP; and (v) Lack of internal monitoring including proper record keeping at factory level. These findings indicate the importance of, (i) Initiating internal quality monitoring with guidelines on how to take corrective actions, (ii) Developing a more reliable yet simple method for quantitative or semi-quantitative assessment of iodine at factory level, and (iii) Redoubled attention to factory owner motivation, need-based training and advocacy. It can be said that almost all salt factories were iodizing salt, without any proper quality monitoring system. The factory owners should be provided with technical assistance on how to improve internal quality control and how to take corrective actions including mechanical adjustment to the SIP. All SIPs and the overall salt factory situation need to be evaluated to consider if any major renovation or re-organization is required. A national survey conducted in 1999 showed that prevalence of goiter was 17.8%. This considered as an improvement since 1993, in which the national survey revealed a high prevalence of total goiter (47.1%). The survey indicated that the prevalence of total goiter in adolescent girls and women aged 15-44 years (55.6%) was much higher than in adolescent boys and men of the same age (33.6%), as observed elsewhere in the world. The use of iodized salt is one of the means to get rid of the diseases, but a section of businessmen are marketing salt without iodine taking advantage of the lack of awareness of the people in the areas. Use of Iodized salt is now estimated at 70% (Urban + rural), and about 73% of the population knows that iodized salt is beneficial. According to a survey conducted by a noted NGO here found that only 45 to 50 percent rural people use iodized salt. Approximately 38,000 crude salt producers produce salt in the coastal areas of southeastern Bangladesh, and edible salt is not imported except following poor salt harvests. However, there is illegal smuggling of relatively cheap non-iodized salt from India and Myanmar. The quality of crude salt produced in the country is often poor because it contains a substantial proportion (10-20%) of mud and other insolvable compounds. This has affected the salt industry performance in salt iodination because the impurities raise the cost of refining the crude salt and hamper the iodination process. In 1989, the Government of Bangladesh passed a law making it mandatory that all edible salt be iodized. The law prohibits the production, distribution, marketing and selling of non iodized salt in the country, and stipulates that all salt for human consumption must contain 45-50 parts per pillion (ppm) of iodine at the time of production and not less than 20 ppm iodine at the time of retail. Defaulters of the salt law face a monitory fine (BDT 5000, approximately US$ 85) and/or jail sentence (3 years). To combat the IDD, the Government of Bangladesh, in 1989, passed the Iodine Deficiency Disease Prevention Act. The Act proclaimed universal iodination of edible salt for human and animal consumption and included prevention, enforcement, and education efforts that were undertaken in conjunction with different government departments and organizations. From IDD news latter of ICCIDD October 1999 it was found that the government of Bangladesh has passed the universal salt iodination (USI) law and accordingly BSCCIC with the financial assistance of UNICEF installed salt Iodination Plants (SIP’S) in all salt factories in the country. Iodized salt is being produced and marketed from the factories since 1995. However it is important to know, weather salt is iodized properly or not. The first evaluation was conducted throughout the country in November 1996. As a part of monitoring, a similar survey was conducted during February and March 1999. Of the total 2064 household surveyed, 1560 was from rural area, 324 from non-slam urban area and 180 were from urban slam area. A total of 2036 salt sample were collected, the rest were unwilling to give salt or had no salt on house at that time of survey. 0.8% had zero iodine in their salts, 45% (including 0.8%) sample contained less than 15ppm iodine as per law and 55% had more than 15ppm iodine in their salts. Most of the respondents from those households (86.5%) heard about iodized salt, 73.1% knew about the benefit of it, few knew that iodized salt prevent goiter but most of them knew it is good for health and very few knew about the law for iodized salt and about the punishments if the law is violated. The most common cause for goitre in the world is iodine deficiency; this condition is commonly called endemic goitre. It is curable by mass food-supplementation with iodine (in the form of iodide or iodate), and today remains a problem only in the least affluent countries which lack economic resources to fortify foods with iodine as part of public health programs. Iodine is necessary for the synthesis of the thyroid hormones triiodothyronine and thyroxine (T3 and T4). In conditions producing endemic goitre, when iodine is not available, these hormones cannot be made. In response to low thyroid hormones, the pituitary gland releases thyroid stimulating hormone (TSH). Thyroid stimulating hormone acts to increase synthesis of T3 and T4, but in excess it also causes the thyroid gland to grow in size as a type of compensation. Goitre is more common among women, but this includes the many types of goitre caused by autoimmune problems, and not only those caused by simple lack of iodine. A cross-sectional study in the endemic villages of Nilphamary Sadar upazilla, showed that, Out of 155 respondents 63.87% was female and 36.13% were male. Mean age was 34.13 with +/- 10.87 and mean monthly family income was 1974.74 with +/- 1025.92 taka, only 65% had > 5000 taka. Level of education SSC and above was minimum (6.46%). Mean occupation was cultivation, day labor and housewife. Only 11.6% respondents had correct knowledge regarding goiter and 77.30% had knowledge about iodized salt. But only 58.71% respondents’ families are using iodized salt according to test result by iodized salt testing solution. The prevalence of goiter among 747 people was found 8.3%, among them 4.53% were male, 12% were female and 6.96% were grade I and 1.07% were grade II (visible) goiter. The study result indicates that the prevalence of goiter still high, knowledge regarding goiter is minimum and use iodized salt is not satisfactory. A study on awareness on iodine deficiency disorder and salt consumption by the rural people of Bangladesh on 1998 in randomly selected six villages of Dhaka, Comilla, Dinajpur, Jessor, Barishal and Sylhet districts, on the household of 200 in each study area and found that the majority of the respondents were illiterate (63.3%), main occupation of the majority was agriculture and household works, median monthly income was taka 2000. Almost 98.5% use tube well water. According to the report of the respondents visible goiter rate was 0.8% of which majority was female (87.5%), old age group constitute that major age group for visible goiter. About 62.7& heard the name of goiter, 6.4% correctly knew the cause of goiter, 88% did not know the cause of goiter, about 81% heard the name of iodized salt and radio & TV were the most common source of information (74.2%). 73.1% informed that iodized salt was available in the market, 5.6% knew that iodized salt prevent goiter, 42% reported that they had been using iodized salt and 35.6% informed that they had been using non-iodized salt. 60% of the sample salt collected for testing contained iodine. Among the non-iodized salt users 62.8% were not using, as it was costly. Indian journal of public health (editorial) stated that iodine deficiency is the world’s single most significant cause of preventable brain damage. It is now evident that globally total numbers “at risk” exceed 1570 million people. Of these, 10% population is in India, an estimated 167 million people are “at risk” of IDD and 54 million people suffer from goiter, the visible ill effect of iodine deficiency. The general mention that iodine deficiency is confined to “endemic” Sub-Himalayan areas needs to be replaced by factual record of wide spread prevalence of IDD. IDD is prevalence in all states of India, from North/northeast to the costal southern state of Kerala and Tamil Nadu. Out of 239 districts surveyed, in 197 districts goiter prevalence range from 10% to over 65%. Iodine deficiency Disorder (IDD) is a significant public health problem in 130 countries, affecting a total of 740 million people. While remarkable measurable progress is being made through universal salt iodination, there are nearly 50 million people who are estimated still be affected by some degrees of IDD-related brain damage. One-third of the world’s population is estimated to be at risk of IDD. Since the passage of a special resolution at the World Health Assembly in 1990 and subsequent resolutions in 1992 and 1996, the Department of Nutrition for Health and Development (NHD) of WHO has worked tirelessly to establish iodination programmes around the world. Over the last decade, extraordinary progress has been achieved by increasing the number of people with access to iodized salt. From 1990 to 1998, the number of countries with salt iodination programmes increased from 46 to 93. Two-thirds of households living in IDD-affected countries now have access to iodized salt. Twenty countries have 90% of their households with access to iodized salt. A study was conducted to assess the prevalence of goiter in South Orissa, India and the community’s perceptions towards the use of iodized salt. 40 children (6-12 years old) were randomly selected from each of 10 clusters and were examined for goiter. 358 children were euthyroid, 42 had grade-I goiter and none had grade II goiter. 92% of parents interviewed knew about what type of salt to purchase. 83% did not know how to identify iodized salt and 2.5% knew that iodized salt was available at ration shops. 79% were not aware of the uses of iodized salt; 4.75% believed that iodized salt was needed to prevent goiter and 11.25% noted that iodized salt was for good health. 55% of retailers said that they sold both non-iodized and iodized salt and 29% were not sure of what type of salt they were selling. 83% of retailers said that common salt was sold more because this was what consumers asked for. 76% believed that iodized salt should be used. Ma. Idelia G. Glorioso in his article, “Why Use Iodized Salt?” said an easy way to ensure iodine supply in your body is through the use of iodized salt in preparing meals. Iodized salt is salt fortified with iodine at levels above the natural state. It is food grade salt, fit for human consumption, and contains the prescribed level of iodine. Iodized salt is just like ordinary salt used to season and make food taste good. It does not make food taste bad or bitter. Iodized salt is not always fine salt. It is any salt, whether rock (coarse), fine or those available in the market using the takal system. Just like any other food, iodized salt can be bought in groceries, supermarkets, and sari-sari stores and even in health centers nationwide. When preparing your favorite dishes, add iodized salt just before the food is cooked and served. This prevents losses of iodine when food is subjected to heat. Use iodized salt when preparing foods that need no further cooking such as dipping sauces, salads, etc. Use iodized salt in boiled corn, pickled vegetables, beef or pork tapa and deep-fried potato slices. As a general rule, however, consume salt and other salty products in moderation. Keep in dry, cool corners of the kitchen. A study was conducted to assess knowledge, beliefs and practices regarding iodine deficiency Disorders in Car Nicobar districts of Andaman and Nicobar Islands. The population was predominantly tribal involved in coconut plantations. All the village heads of the sixteen villages and parents of 10% of the school children examined for goiter were interviewed. A total of 114 persons were interviewed 60 males, 54 females. The local name for goiter was “Rulo” and 44% felt that it only affected females. No one had correct knowledge of the cause of goiter. About half of the respondents believed that these swellings caused problems. Sixty-three (55.3%) of respondents believed that there was treatment, of which 33 said there was medical treatment, 18 respondents said traditional treatment by “LAM-EEN” and 12 felt that both therapies are required. Majority (85%) brought salt samples from the Government canteen. They did not now whether this salt was iodized. Salt was not washed before use and storage practice was satisfactory. The awareness about IDD needs reinforcement. (8 respondents, 22.9%). The kitchen survey revealed various sources of ingredients with a salty taste (Table 3). The most common was mined salt (65.7%), and only 34.3% of households had iodine supplementation (all from iodine-enriched salt). No iodized water was used for supplementation. Further enquiry revealed that iodized salt and iodized water were unpopular due to their unpleasant taste. In addition, natural fish sauce and salt-derived fish sauces were difficult to obtain and judged too expensive to use. Kapil et at stated that a successful for the prevention of IDD is salt iodination. Salt is an effective for fortification with iodine because all socio-economic groups consume it universally in all most equal quality. It has been documented that salt with iodine content of 15ppm at the consumer level can meet the iodine requirement of human body. The government of Himachal pradesh, under the National Iodine Deficiency Disorder control programme, has adopted a policy of salt for salt iodination since 1976. Under which the entire population of the state is to receive edible salt with a minimum of 15ppm of iodine. However a survey conducted by national goiter team has reported high prevalence of goiter in Una (9.9%), Kangra (32.1%) and Kulla (41.2%) districts of Himachal pradesh. Iodine deficiency disorder has long history of existing, now it is a global public health problem. Billions of people are suffering in this problem. It is more prvalent in developing countries. Some of the developed contries like USA, England, Switzerland, New Zealand and Australia have eliminated IDD from there country. In Southeast Asian region countries like, Bangladesh, India, Pakistan, Thailand, etc. countries are still fighting with IDD and trying to develop a proper way to eliminate IDD from these countries. Though goiter rate is reduced in these countries, due to lack of knowledge about Iodine Deficiency Disorder and Use of Iodized salt, these countries are struggling to eliminate IDD. At the same time in some cases, they have the knowledge about the benefits of iodized salt but the poor socioeconomic condition is not helping them to use iodized salt. Government of these countries is taking various steps but still due to some lacking, they are not reaching their goal. The Government should do more research on this issue and should take more effective steps to eliminate this problem before time runs out. This is a Descriptive type of cross sectional study. The study was carried out in Barogram and Purbadebator, two villages of chyni union of Razarhat upazilla under Kurigram district. It was 15 Km from the Kurigram town and situated about 340 Km north to Dhaka city. The area of both the villages together is about 1.5sq-km, with 200 households comprising 986 populations, out of them 527 were male and 459 were female. The study place was purposively selected. The study period was from March ’07 to June 2007. All the people of the study area were examined physically for detection of goiter. Only one person from each house was interviewed for collecting socio-economic characteristics and assessing knowledge about IDD and iodized salt and one sample of salt was collected from each household for testing of iodine. Total population examined was 986 and total salt sample collected was 200. Sample size was 200 determined by appropriate statistical method and one person from each household was interviewed. A questionnaire was prepared containing both structured and unstructured questions and also a checklist was prepared for the prevalence of goiter and detection of iodine in the sample salt. Data was colleted through face-to-face interview with a pre-tested questioner and observation by checklist. Every house of the villages was visited for information collection and only one person from each house was interviewed. Preference were given to the adults for interviewing but when they were not willing other members of the families were interviewed but all the people from the villages were examined for detection of goiter. One salt sample was collected from each house and was tested for iodine by salt testing solution. Small amount of salt was taken, with which 1 drop of salt testing solution was mixed. If the colure of the salt becomes violate then it means iodine is present in the salt. If there is no colure change then there is no iodine in the salt. After collection of data, these were checked, verified and edited manually to reduce error. The data was processed manually and a master sheet was prepared. From the master sheet using scientific calculator and computer, compilation and tabulation was performed. This study was carried out in two selected villages, to find out the use of iodized salt by rural people, assessing the knowledge regarding iodine deficiency disorder and prevalence of goiter. A total of 200 households were visited and 200 respondents were interviewed, with 986 people were examined to find goiter cases. 200 salt samples were collected, one from each household and tested with iodized salt testing solution. Female respondents were more than male, this may be because of the study was conducted at household level and most of the male members of the families were working. Mean monthly family income was 4635.51/= per month. Mean age of the respondents was 36.1 years; Literacy rate was 35.5%, which corresponds with UNDP HDR 2005 findings of 31.4% but level of education higher secondary and above was minimum (5.5%). Day laborer, cultivation and housewife were the main occupation with only 6% doing business and 3.5% were service holder. Most all of the female respondents were housewife. This may be a cause of average low per month income of the community. About 87% of respondents have heard the name of Iodized salt and about 74% of the respondents know that iodized salt can prevent goiter, which is similar to the national survey in 1999 and also consistent to some other study. 12.5% of the respondents were open salt users but only 62.5% household salts had iodine. This finding was almost similar to other study done in Bangladesh in 1998 where 60% used iodized salt. But this finding is an improvement over the findings of Sarker FH in 2001, which was 58.71%, may be due to improved health education in the community. But the cause of not using iodized salt is similar; the most common cause of using open salt was high price of packet salt in comparison to open salt. This reflects the low socioeconomic condition of the community. The prevalence of goiter found was 4.86%; this finding of prevalence of goiter is much lower than the findings of national survey conducted in 1999, which was 17.8% and also lower than the national IDD survey in Bangladesh. 10.51%. Among them 70.83% were female and 29.16% were male. Of them 2.83% were grade –1 goiter and 2.02% were grade-2 goiter. The prevalence of goiter had decreased than before but it still remains high. Though they have knowledge that iodized salt can prevent goiter or IDD, poor socio economic condition and illiteracy may be the cause of not using iodized salt and abstracting the way of elimination of IDD from the community. None had good knowledge about iodine deficiency disorder, only 3.5% had moderate knowledge about IDD and 21% knows nothing, but the name of Goiter as iodine deficiency disorder. Iodine deficiency disorder is a global health problem and now Iodine deficiency is the most common preventable cause of brain damage. By lacking knowledge about iodine deficiency disorder, we are ignoring the easily preventable health problems caused by iodine deficiency, such as mental retardation, low birth weight, repeated abortion, etc. The probable cause of decreasing the prevalence rates of goiter than that of NIDD survey conducted in 1993 might be due to increase knowledge and use of iodized salt, influenced by the government. It might also due to smaller sample size and purposive selection of the study place. Though the universal use of iodized salt law persists, the use of iodized salt is still not satisfactory. Non- iodized salt is available in the market and large amount of people are using it because of low cost and lack of knowledge about the benefits of iodized salt. Among the 986-study population 53.44% were male and 46.55% were female. 62.5% of the 200 salt samples collected found to contain iodine while tested with iodized salt testing solution. Prevalence of goiter was 4.86%, of which 29.16% were male and 70.83% were female. Among the 48 goiter cases 58.33% were of grade-1 goiter and 41.66% were of grade-2, which in 986 populations, grade-1 was 2.83% and grade-2 was 2.02%. Regarding knowledge about causes of IDD none had good knowledge about IDD, only 3.5% had moderate knowledge about IDD and 21% of Respondents knows the name of goiter as IDD. Majority of respondents 87% knows the name of iodized salt, but 12.5% respondents uses open salt, all of the replied due to high cost of packet salt they are not using it. Though prevalence of goiter has been decreased than before, but it is still remaining high. Knowledge about IDD is not sufficient and use of Iodized salt is not satisfactory. Though law persists, non-iodized salt is available in the market and large amount of people are using it because of low cost and lack of knowledge about benefits of iodized salt. Iodine deficiency disorder programme should be continued with top priority as a major preventable public health problem. Appropriate measures to be taken to improve the knowledge about IDD and to increase the use of iodized salt by reducing the price of iodized salt. Proper implementation of IDD prevention act 1989 should be ensured to control Iodine deficiency disorder by prohibiting sales of non-iodized salt and prevention of smuggling of non-iodized salt through borders. Health education programmes should be expanded by involving socially recognized people like head of the, school and collages, Immam of Mosques, Father of churches and mass media, for creation of awareness among the people about iodine deficiency disorder and benefits of Iodized salt. Marketing of non-iodized salt should be prevented by strengthening implementation of iodine deficiency prevention act 1989. Intensification of iodine deficiency disorder control programme with primary health care and HNPSP. Strengthening the IDD elimination programme through the involvement of Health and health related sectors including NGO’s, political, social, cultural and administration. Measures to be taken for training of health and health related personal including, teachers, religious and social workers. 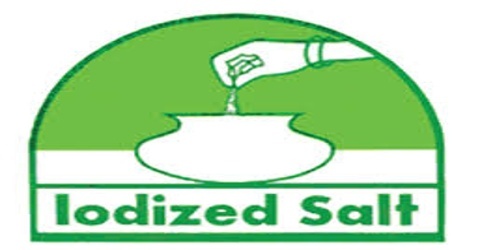 Prices of iodized salt to be reduced so that people can purchase it easily. Smuggling of non-iodized salt through borders should be prohibited. Proper action should be taken against the non-ionized salt producing factories and retailers, who sales non-iodized salts.